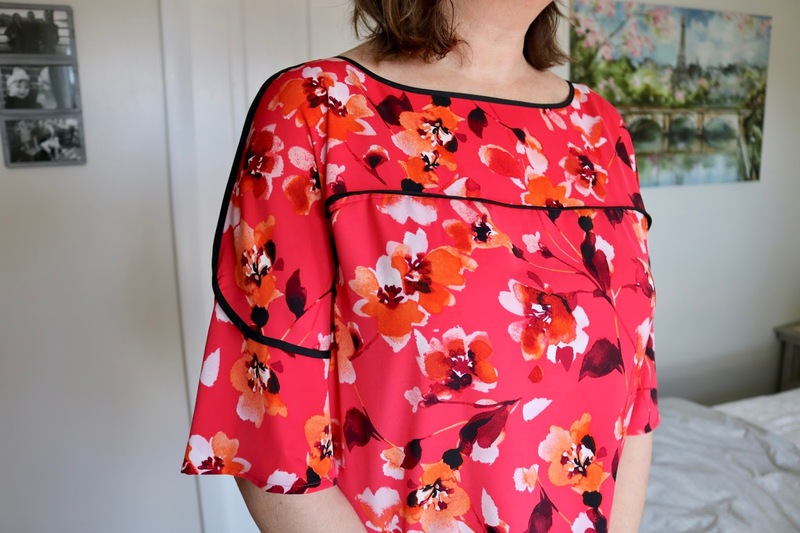 This pretty floral coral top by Calvin Klein is the last piece from my Fix #15 that I have to show you. Like the other four pieces in that Fix, I also returned this one. It's a size Medium, but I could tell before I even tried it on that it would be too big. I could have asked for it in a smaller size, but it had a very boxy cut so I wasn't sure I would like it even if it was smaller. The top does have a lot of redeeming values though. I love the color, the print, the belle sleeves, and the black piping. It even has a longer length in the back as it does in the front. It just was too big and boxy and I thought it made me look bigger than I am. 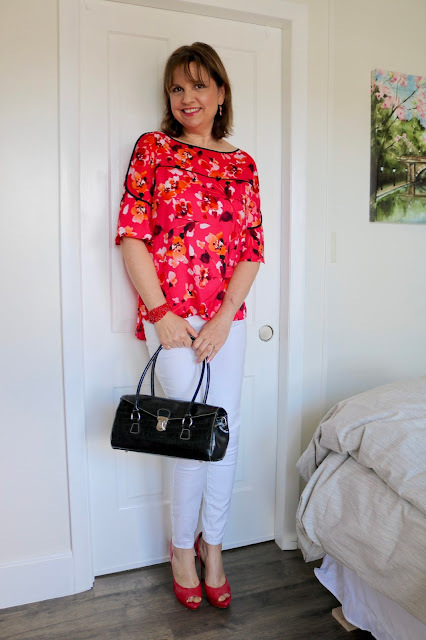 I styled the top with white jeans, coral heels, and a black handbag. In this photo you can see the nice longer length the top has in the back; nice if your someone that likes to keep that part of your body covered. 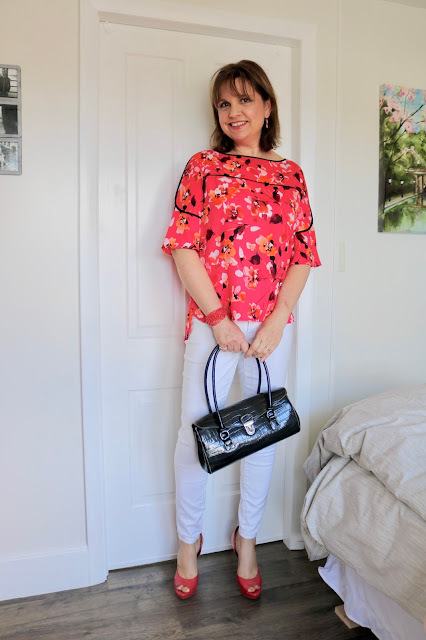 I couldn't believe how my coral heels matched the top so perfectly! I really did like the contrast of the solid black piping against the coral. 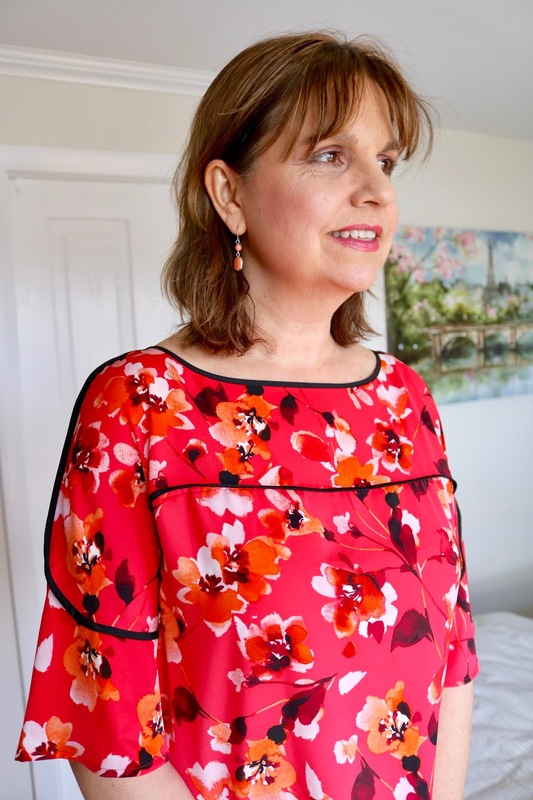 I chose coral earrings and a coral bracelet for jewelry. 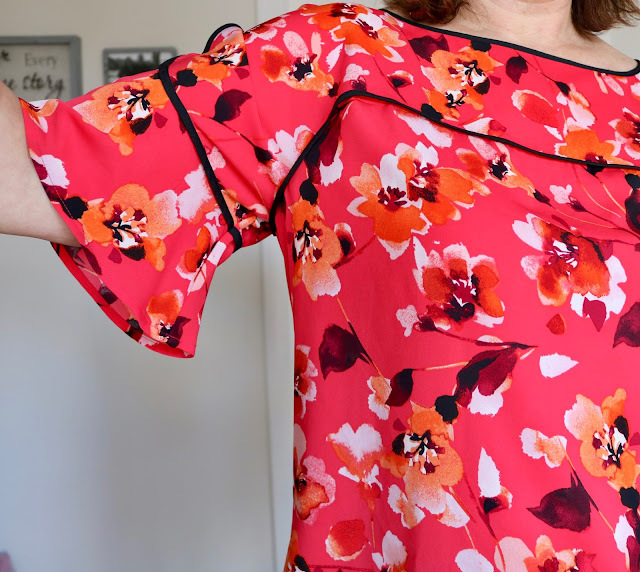 The floral print is a pretty watercolor style, and I love the belle sleeves. 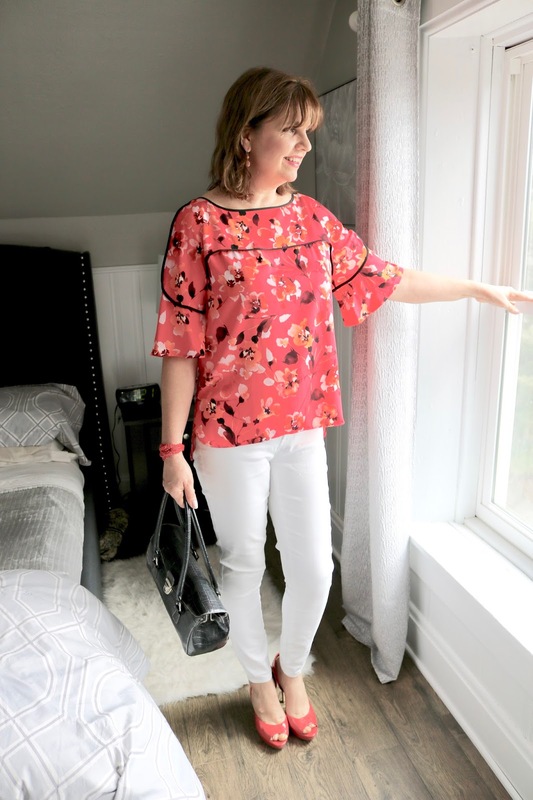 And this concludes my Stitch Fix #15 fashion posts. In summary, here is what else I received in that Fix...all of the items were returned. In summary, I received two items that I returned that I wish I would have kept. I really wish Stitch Fix would let you keep the items longer before you have to send them back. I feel I don't have enough time to get every one's feedback before I have to return them. I've also learned to trust my husband's opinion more than my own! GASP! But he has always been right! He really liked the floral dress and the floral and gingham top in this Fix too. And in my sixteenth Fix, he was really right! But you'll hear more about that next month! A friend of mine suggested that I ask Stitch Fix for these items again in my next Fix, so I'm gonna try that. Thanks Patti! My next Fix was much better! I did keep something that time. I would have kept two items but one was too expensive! It's such a lovely color Amy!! I know my mom would say to take in the side seams and make it a little more fitted if you don't like the boxiness!! And I know what you mean about the husband's opinion. I ask my hubby all the time. I think it's a different perspective, because we see ourselves differently!! I know how to sew, but I don't want to if I don't have too! :) Your so right about the hubbys providing a different perspective. He always gets me outside my safe zone. The black piping on that first top is unique. Fits you well. This is a beautiful look Amy. I love how well the shoes match the shirt. I like this shirt and the pretty dress the most from this fix. So perfect for warm spring days and summer! Can't wait to see what you received in your latest fix! Thanks Ellie! I liked so many things about this top as well! I do love that gingham and floral top and that dress is gorgeous. I would definitely try to hunt them down again if they can't send them back to you! Thanks Ruth! I'll give it a go! I thought all of the items in your box were keepers. This darling top included. I can relate, though, to tops being boxy. And I remember you felt the dress (beautiful) was a bit snug in the bust. Wish, oh, wish you had kept the gingham floral. Beg your stylist to send it to you!!! Oh Leslie I could kick myself for sending that gingham floral top back and not requesting the dress in a larger size. I think I feared with the dress that if I got a larger size, then it would be too big everywhere else. It fit perfectly everywhere but the bust. I think that top is really cute, but I know pictures can be deceiving. Photographs only show one angle and you can't see how it looks when it moves. It's too bad your box didn't work out well for you! Oh Wow! Perfect outfit, love that you had those shoes on standby ready for this perfect pairing with the top. Super outfit. Hugs, x. Thanks Laura! 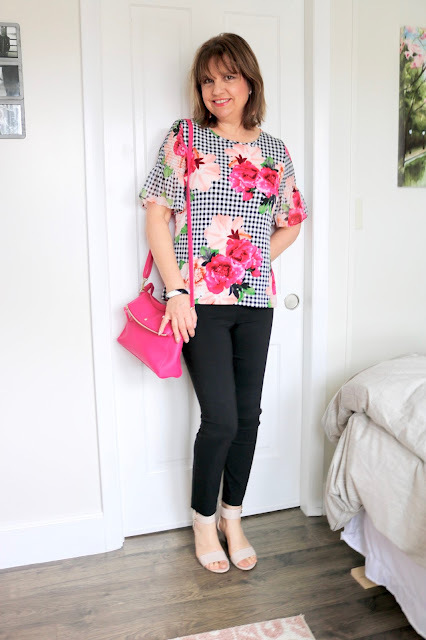 Yes, my husband and I have become quite skilled at knowing how to photograph me to always show my best side so I don't think the boxiness of the shirt really was obvious in this post. Thank you...yes, I can't wear these shoes much in real life as they are way too high for me, but they are perfect to keep on hand for photo shoots! I love the coral and black. I used to think I couldn't wear coral, but now I'm loving it. Great bracelet and shoes with the combo, too. 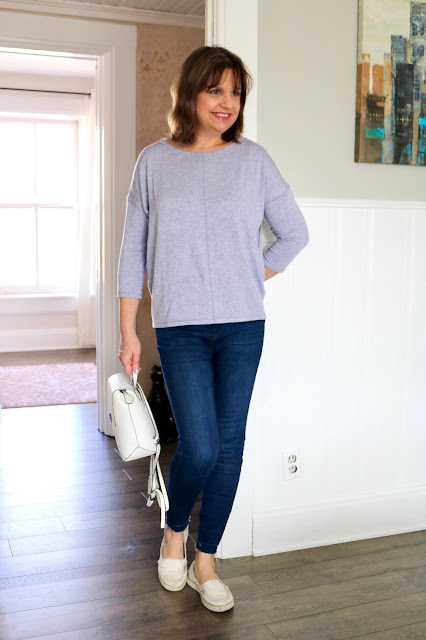 I'm thinking of doing Stitch Fix again, but have only done it once so far. Maybe you've inspired me! I think I may have set too low a price point before, and that's why I didn't like much of what they sent me. I'll have to be more realistic next time. Thank you! Yes, Stitch Fix is expensive. But its worth it because they have a lot of unique pieces! This is such a sweet and chic look dear. 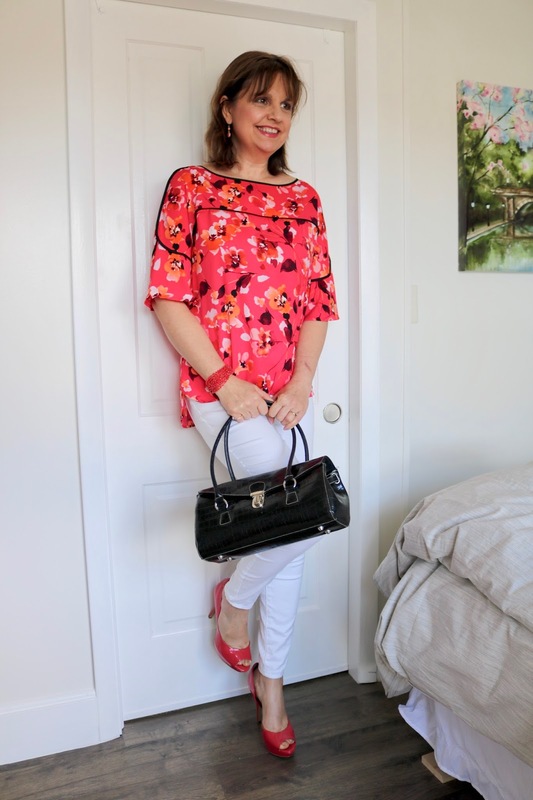 Love the coral heels, really perfect for the floral top and white denim pants. the coral color is so pretty on you and I did like the print. Too bad it was too big! Your white denim looks fab on you. Perhaps they will give you more time to think about things in the future.. I dont always like to decide right away!